With Arnold Schwarzenegger set to return (or be back) as The Terminator, the role that made him famous in 1984, in upcoming film sequel/reboot Terminator Genisys. I thought I’d look back at the cinematic outings of The Terminator franchise. The Terminator: Released in 1984 by Orion Pictures, written by Gale Anne Hurd and James Cameron and directed by James Cameron. 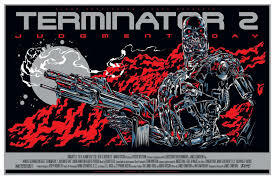 The Terminator was a low budget Sci-Fi/Action film that nobody expected too much from, yet in 2008, The Terminator was selected by the Library of Congress for preservation in the American National Film Registry, being deemed “culturally, historically, or aesthetically significant”. From the year 2029, two beings are sent to Los Angeles on May 12 1984. One is a Terminator (Arnold Schwarzenegger) cyborg assassin, Cyberdyne Systems Model 101 (T-800), which is a metal endoskeleton covered in living tissue. This Model 101 terminator is programmed to kill a young woman called Sarah Connor (Linda Hamilton). The other one is a human soldier Kyle Reese (Michael Biehn), sent back to 1984 to protect Sarah Connor by Sarah’s own son in the future, John Connor. Kyle finds Sarah and explains that in the near future an artificial intelligence defense network called Skynet becomes self-aware and initiates a nuclear holocaust of mankind, wiping out most of humanity. Kyle tells Sarah that her yet to be conceived son John Connor will rally and lead a resistance of survivors that acts against Skynet and its army of machines. With the Resistance on the verge of victory, Skynet has sent a Terminator back in time to kill Sarah before John is born, effectively killing John in a last-ditch effort to avert the formation of the human resistance. A wonderful melding Science Fiction, Thriller, Horror and Action. The Terminator was one of the seminal films of the 80’s and would go on to spawn a successful franchise including sequel films, comic books, novels, videogames and even a groundbreaking Universal Theme Park attraction. The Terminator was released to very little publicity as Orion Pictures really had very little faith in the film performing well. However, The Terminator grossed over $4 million in its first weekend and stayed at the number 1 spot for 2 weeks. The film went on to make $78.4 million worldwide at the box office, all from a $6.4 million budget. The Terminator was considered a huge success and launched the careers of writer/director James Cameron and its star, Arnold Schwarzenegger. Reviews were positive praising the dark tone and style as well as the intriguing plot, along with praise for Arnold Schwarzenegger’s performance as The Terminator which has gone on to become one of cinema’s very best villains. The Terminator was met with controversy from writer Harlan Ellison who said the film “borrowed heavily” from a short story he had written which was turned into an episode of The Outer Limits TV show called; Soldier and Harlan Ellison threatened to sue Orion Pictures for infringement. Orion Pictures settled in 1986 and Harlan Ellison was awarded an undisclosed amount of money and an given acknowledgment credits in later prints of the film. The Terminator had a bittersweet ending in which everything was covered, but a sequel came about just a short 7 years later. Terminator 2: Judgment Day: 1991 saw the release of Terminator 2: Judgment Day (T2), produced by Carolco Pictures and reunited James Cameron with Arnold Schwarzenegger and Linda Hamilton from The Terminator. Written by James Cameron and William Wisher and directed by James Cameron. T2 is often said to be one of the best movie sequels ever. This time the plot revolves around a new and more technically advanced terminator, a T-1000, being sent back from 2029 to 1995 by Skynet to target the now 10 year old John Connor. This new advanced prototype T-1000 was is a “mimetic polyalloy” being made up of liquid metal that is capable of mimicry, shapeshifting and rapid recovery from damage. But to counteract the more advanced T-1000, the resistance lead by John Connor send back another T-800 they captured and reprogrammed to protect 10 year old John Connor. With Sarah Connor being held in a mental hospital due to her “delusions” of the future and her talk of a soon approaching nuclear war started by Skynet that will wipe out most of humanity. Young John Connor orders the T-800 to help save his mother after he learns that the T-1000 would typically target and kill her. Along the way, Sarah Connor learns the man most directly responsible for Cyberdyne Systems creation of Skynet and the terminators is a man called Miles Dyson. Sarah sets out to kill Miles to prevent the creation of Skynet. All while being hunted down by the superior T-1000 terminator. T2 was a revelation in terms of filmmaking at the time and pushed the relatively new computer generated images in films with the T-1000. T2 even went on to win four Academy Awards for Best Sound Editing, Best Sound Mixing, Best Makeup, and Best Visual Effects. Praise came in for relatively unknown actor Robert Patrick who played the T-1000 but there were several mentions of the “uneven” acting from the 12 year old Edward Furlong. Linda Hamilton as Sarah Connor gave the performance of her career in this film and showed a very deep and intriguing character. Arnold Schwarzenegger, who had carved a very reputable career as the good guy in films by now did not want to return as a villain this time around. So it was decided early on in pre-production they would bring him back as the hero, hence the concept of the reprogrammed T-800. The budget of T2 was $102 million which was the highest budget for a film ever at the time. Making back $54 million in its opening weekend and $204.8 million in the United States and Canada alone, then going to make $519.8 million worldwide. T2 was the highest grossing film of 1991. However the film was very nearly never made with rights disputes over the IP pre-production. At the time Hemdale Film Corporation owned the rights to the Terminator IP and they tried to hinder any efforts to make a sequel. In a bit of bitter schadenfreude, Hemdale Film Corporation were experiencing financial problems. 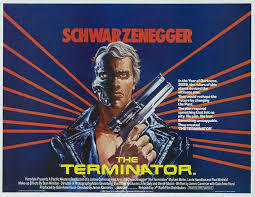 So head of Carolco, Mario Kassar bid for the rights and eventually paid Hemdale $5 million for the Terminator franchise in 1990, paving the way to make the sequel. I’ll end part I here and move onto part II where I’ll cover the last two films in the franchise so far. This entry was posted in LBoM: Retrospectives and tagged Little bits of gaming, movie retrospectives, T2, Terminator 2, The Terminator on 18/05/2015 by Steve Perrin.